What type of cloud is right for my organization? When talking about different types of cloud, it is important to differentiate between computing models and service models. Computing models, broadly speaking, refer to the type of environment and access – whether organizations share hardware, storage, and networking with others. Service models refer to the type of service an organization is using: infrastructure, platform or software. Be aware that any service offering can be delivered in a public, private or hybrid cloud environment. Zones offers cloud computing solutions with agility and security in mind. Learn more by contacting your Zones account manager or send an email to cloudsolutions@zones.com to reach a dedicated cloud solution specialist. Before evaluating what solutions or workloads you want to move into the cloud, it is important to decide what type of cloud is best for your organization. There are three basic types of cloud computing models, each with their own advantages. Public cloud is a multi-tenant environment where clients share hardware, storage, and network, but keep their data isolated from and invisible to other tenants. In other words, multiple organizations all rent space on a 3rd party's hardware. Each client's data is virtually separated from each other, but stored on the same machine. This is the most cost-effective cloud model. 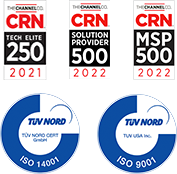 While all data is secure, some organizations have strict regulatory requirements that necessitate dedicated hardware, and that is when a private cloud solution may be the right choice. Private cloud is a single-tenant environment where the hardware, storage, and network are dedicated to a single client or company. An organization is still renting from a 3rd party, but they are renting the entire server, not just a server slice. While this is still less expensive than on-premise solutions, it is more expensive than public cloud. Hybrid cloud is policy-based service provisioning, use, and management across both public and private environments. Your organization decides what workloads to host in a public cloud and which ones to host in a private cloud. This is the most common type of cloud computing, providing the benefits of both worlds: the cost savings of public and the added security and control of private cloud. 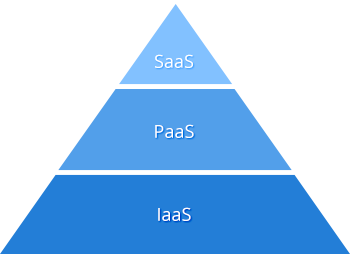 Cloud is often described as a stack and depicted as a pyramid, which reflects the different levels of cloud service offerings. There are 3 basic services, SaaS (Software-as-a-Service), PaaS (Platform-as-a-Service) and IaaS (Infrastructure-as-a-Service), although the proliferation of variations has given rise to the term "x-as-a-Service," referring to any number of as-a-service offerings. DR-as-a-Service (Disaster Recovery-as-a-Service) is another common model, but we will be focusing on the three primary ones. IaaS (Infrastructure-as-a-Service) is the bottom layer of the pyramid, or the foundation, and can also be thought of as hardware as a service. It is the broadest version of cloud services and meets the minimum requirement to be considered a cloud solution. You rent the physical equipment from a 3rd party, but are responsible for installing and maintaining the operating system and applications. This provides the most amount of control of all the service offerings, but also requires the most amount of work on your end. The middle layer of the pyramid is PaaS (Platform-as-a-Service), which allows your organization to develop, run, and manage applications without having to build and maintain the associated infrastructure. In this instance, you are renting both the physical equipment and outsourcing the responsibility for installing and maintain the operating system, and are only responsible for applications. SaaS (Software-as-a-Service) refers to software that is owned, delivered, and managed remotely by one or more providers and licensed to customers on a subscription basis. This requires the least amount of maintenance on your end, as your cloud provider provides the infrastructure, platform and software; all you are doing is paying to use the applications.